Most perks from other popular superpowers could be accomplished by teleportation anyway. Flying might look cool, but just teleporting would get you anywhere you might fly even faster. Invisibility gives you prime prank potential, but if you just want to sneak around, teleporting in somewhere at odd hours probably works well enough. I admit that it won’t help you read minds, but do you really want that? Didn’t you learn anything from What Women Want? And I’ll entertain arguments that being able to freeze time would come in handy, but I’m concerned overuse would cause you to age appreciably faster than friends and family. Part of what makes teleportation so cool is how unaccessible it is. Plenty of technologies both new (this jetpack) and old (airplanes) approximate flying; as of last year, science was getting close to a usable invisibility cloak. But despite bold claims made by Star Trek and Willie Wonka, we’ve yet to beam anyone up or even transport chocolate via Wonkavision. But Mr. Wonka, it turns out, might’ve been on to something. Microsoft just released a new video demonstrating something they’re calling “holoportation,” which uses 3D cameras and HoloLens, their augmented reality visor, to create realtime holograms with which you can interact. The system is still pretty clunky. 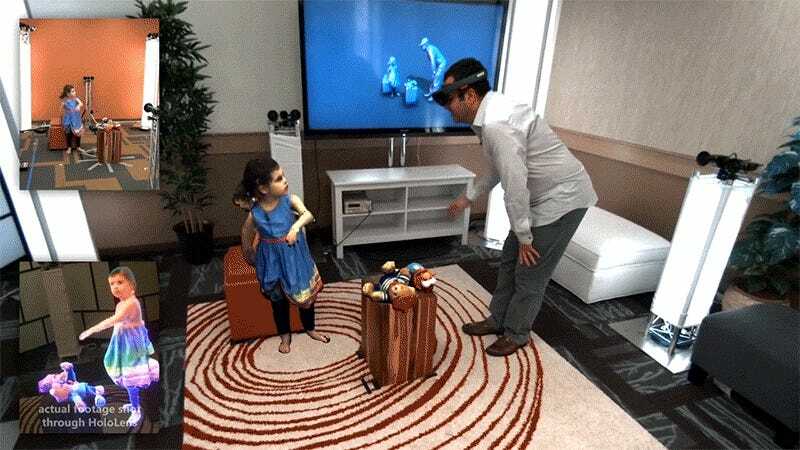 The person who wants to be holportated must be surrounded by multiple 3D cameras, and unless both people have the same elaborate setup, whoever is wearing the HoloLens can see the other person—but not vice versa. But, setting aside any sci-fi expectations, this technology is still really amazing. The video emphasizes the communication capabilities, imaging that tech-savvy families of the near-future will use this to slightly less virtually interact with loved ones from far away. 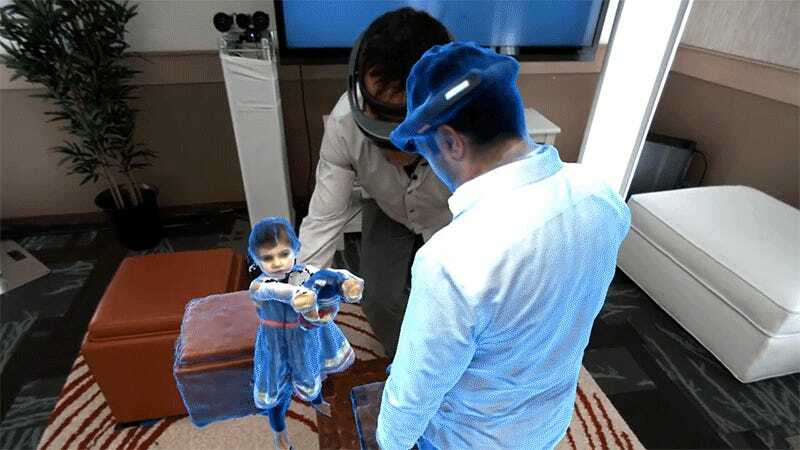 In addition to real-time holoportation, the video also demonstrates the ability to record and replay captured holograms, like three-dimensional home videos. Plus, these recordings can be shrunken to tabletop size for when you’re asking Obi Wan Kenobi to help you, since he’s your only hope.